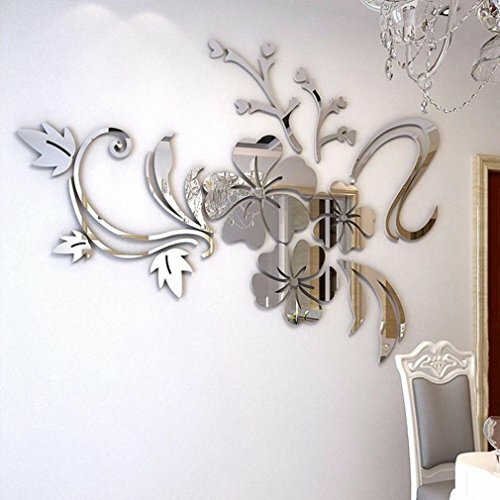 ✪Light weight, easy to install, good mirror effect.Fashion personalized home commercial space decorative DIY arts.Comes with stickers on the back, can be directly attached, properly installed to ensure that never fall.Can be used in TV setting wall, sofa setting wall, dining room, bedroom and wardrobe. ✪Note:Please allow 1-3cm errors due to manual measurement Item color displayed in photos may be showing slightly different on your computer monitor since monitors are not calibrated same. Light weight, easy to install, good mirror effect.Fashion personalized home commercial space decorative DIY arts.Comes with stickers on the back, can be directly attached, properly installed to ensure that never fall.Can be used in TV setting wall, sofa setting wall, dining room, bedroom and wardrobe.